If you’ve gone through a divorce, you know there are many things you’ve had to reset in your life. You have rearranged your living situation, property, possibly custody of children, and finances. It’s an emotional life upheaval that brings many challenges to overcome. After the dust settles you may feel like something else should be rearranged: your jewelry box. As you open it, there may be pieces of jewelry that catch your eye and spark good memories, or good memories that have since been stained. Maybe you’ve already removed some of these things because you know you won’t be wearing them. It might be time to say goodbye to some of these things from your past, as you embrace a fresh start. Usually when you are ready to let go of things, you might box them up and donate them to a local thrift store or charity. Clothes, shoes, and old lamp, or books. But what about valuable jewelry such as your engagement ring? That’s not something you can drop off at Goodwill. When it comes to your engagement ring, what should you do with it? Keep it? Sell it? Save it for one of your children? You will have to do some thinking and soul searching before you decide for sure. If you are open to the possibility of selling your engagement ring, here are some steps to take to help walk you down that path. Just as you don’t make a large purchase such as a house or new car in a hurry, take some time to make sure you’re ready to sell your ring. Don’t begin what could be an emotional journey without being confident you can handle it. Some may see their engagement ring as a symbol of hope that they may get back together with their former spouse, so saying goodbye may be difficult for them. Or maybe you’re eager to sell and feel very little emotional attachment to your engagement ring. Still, give yourself a few days and check in with a few people you trust to make sure you are doing the right thing. How long do you wait? A month would be a good idea. It doesn’t have to be an exact 30 days, that’s just a good length of time to gauge how you may feel over an extended amount of time. The point? Give yourself time, and all the time you need to feel sure and ready about this step. Once you’re open to the idea of parting with your engagement ring, it’s time to do a little digging and learn all you can about your ring and what it might be worth. Years ago, the vast information on the internet was not available to us to learn about the shape, color, and clarity of a diamond ring. People would just have to take their local jeweler’s word for it as far as details about their ring and it’s worth. “Until the middle of the twentieth century, there was no agreed-upon standard by which diamonds could be judged. GIA (Gemological Institute of America) created the first, and now globally accepted standard for describing diamonds: Color, Clarity, Cut and Carat Weight. Today, the 4Cs of Diamond Quality is the universal method for assessing the quality of any diamond, anywhere in the world. Maybe you’re the divorcee mentioned earlier- no emotional qualms and no attachment to your ring. You’re ready and have been ready! Try not to pick the first buyer (or pawn shop!) you come across. That’s not going to be the path to your best offer. You may not be able to meet with a buyer in person, possibly for many reasons. Maybe you’re just too busy to take the time. Maybe you are a little embarrassed or shy to arrive at a jewelry buyer bearing the obvious signs of a failed marriage. Don’t worry, you can still attain a trustworthy appraisal of your engagement ring. At Truval, we offer free expert appraisal from anywhere with their safe, world class FedEx mail in service. You can receive an online appraisal or make an in store appointment. Describe your Items. Start by filling out the Get A Quote form or call in to discuss your items potential value. Your selling options. To sell your items, schedule an in-store appointment or access our free and insured FedEx mail-in service. Get your offer. Their leading experts will evaluate the diamond along with its associated brand, design, and its accompanying setting. Get paid. In-person sellers receive cash within minutes. Mail-in sellers receive immediate payment via check or wire. Once you receive your quote, you can now move forward with this new information. Now you may feel even more ready to let go- keeping something with a lot of value hidden in your closet can begin to seem very impractical. After your appraisal and sale of your engagement ring it’s only natural to think of all the possibilities open to you with some extra cash in your pocket. Selling your engagement ring can have a positive financial effect on your new life. You are blazing new trails in your life, and see this as one more. Don’t feel guilty or harbor any regrets about your decision. This financial step can help you in your fresh start. Selling jewelry such as engagement rings or wedding bands can give women and men closure on the past and something that feels almost tangible to grasp as they move into the future. The last thing you need in your life is more pain or hurdles to overcome. So know that selling your engagement ring can be a painless, private, stress free experience. Move forward with courage and the bravery you know you have inside. Take some time to think about what you will do with the money you receive from the sale of your engagement ring. Maybe you need the money to pay off some debts accrued from the time surrounding your divorce. Or, maybe you would like to set the money aside in a savings account for your child(ren). Possibly you need to get away after all the stress and upheaval that has happened in your life. You could use the money to take a much needed vacation from regular life. Whatever you have decided to do, remember that the sale of your engagement ring can and should be a stress free and painless experience. 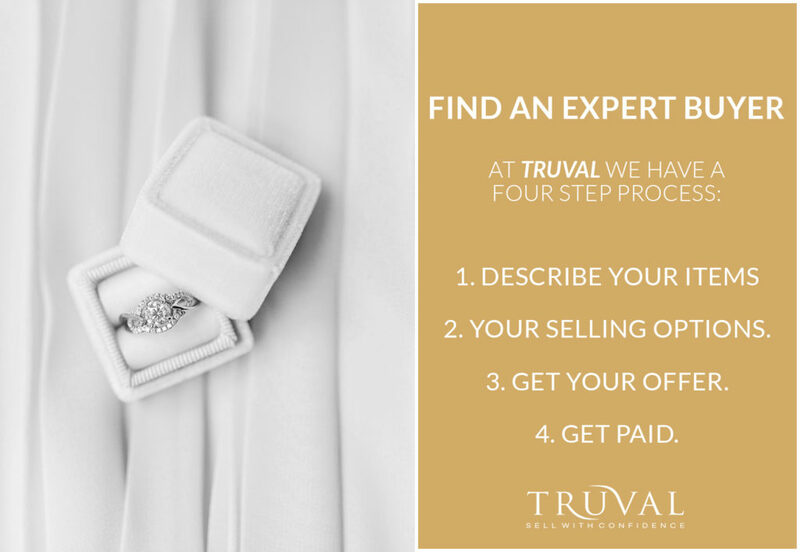 In fact, once you realize that selling with a business such as Truval can be so easy, you may consider selling other pieces of jewelry such as a wedding or anniversary band. When you are ready to explore the option of selling these things, move forward knowing you can walk away with a positive experience and obtain some extra cash!